Ray Gould, a long time resident of Edmonds, Washington, graduated from the University of Washington in 1953 with a Master’s Degree in Mechanical Engineering. He worked at Scott Paper Company in Everett, Washington for 35 years in various management positions, and as Facilities Director he directed the Engineering and Maintenance departments. 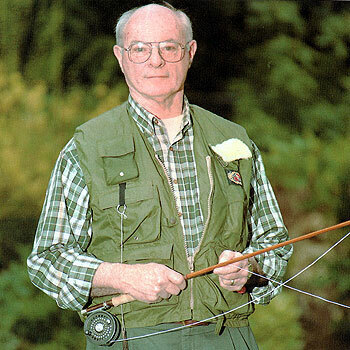 Ray Gould has been building bamboo fly rods since 1958. Join us to hear this master rod builder talk about the machines and tools necessary, selecting cane, creating precise tapers, step-by-step construction, finishing steps, and many more tips on building bamboo rods. Community service has played an important role in Gould’s life. He was appointed three times to serve as a Community College Trustee, won election twice as an Edmonds City Councilman and served as a County Planning Commissioner. In addition he was appointed to the Citizen’s Oversight Panel for Sound Transit, chaired the Performance Audit Committee, served on the Board of 1000 Friends of Washington and on the Board of the Luther Child Center. Ray became a fly fisherman in 1958 when he first visited Glimpse Lake, B.C., now his favorite spot on earth. He served as President of the Northwest Fly Anglers, taught fly tying, and is currently a member of the Olympic Fly Fishers of Edmonds. He has been building and repairing bamboo fly rods since 1958. He uses his engineering background to design and build the necessary tools and equipment and uses computer programs to design rod tapers. He taught bamboo rod building at the Federation of Fly Fishing Conclave in West Yellowstone, Montana. Gould has presented programs at numerous fly clubs in Washington and British Columbia and co-chaired two West Coast Bamboo Rod building workshops at Corbett lake, British Columbia. His “Double Parabolic” rod tapers have become a hallmark of his work. As an entrepreneur Gould handcrafted some 180 Bamboo fly rods in his workshop and repaired hundreds of other cane rods. In the Northwest he was known as the “go to” guy when it came to cane rods. Ray and his wife Susan (former State Senator) resides now in Bothell, Washington. They have three children Kevin, Meredith and LeaAnn.